This recipe uses sole fillet as its base. Sole is a fish that is very delicate and rarely sold whole. It is usually found in fillet form both fresh and frozen. I used fresh fillets in this recipe. The advantage of sole is that it cooks in minutes. This recipe presents sole as if it were a roll that contains delicious vegetables. It’s a light meal that can quickly provide a dinner for guests. This preparation is unusual and a good way to present and guarantee a delicious dish. In a pot, bring about a quart of water to a boil with a little salt. Wash and dry the sole fillets then cut the zucchini into sticks, about 8 cm in length. When the water boils, add the zucchini sticks and cook for 3 minutes, then drain the sticks and place them on a plate dividing them into 8 portions. Butter an ovenproof dish and place a bit of zucchini in the center of each fillet. Bend the ends of the sole so that it forms a roll. Place the rolls in a baking dish. Arrange the rolls so that the edges of the fish overlap one another. When you have finished preparing the rolls, add salt and pepper then sprinkle them with bit of brandy. Place the sage leaves over each fillet and put a half a slice of pancetta and the remaining butter that has been shaved into flakes. Bake for 30 minutes. Serve two rolls per serving. They pair very well with baked potatoes and a salad. 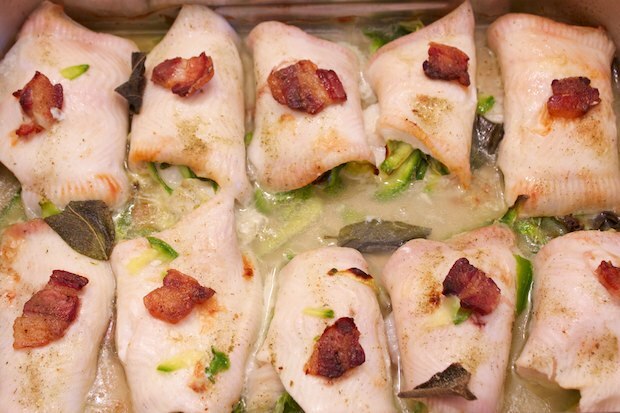 Posted in Fish and tagged with Filetti di Sogliola con Zucchine, Sole Fillets with Zucchini. RSS 2.0 feed. Li ho preparati per una cena con degli amici e sono stati molto apprezati. Grazie dell’idea e complimenti per il blog! We Cook at Home © 2019. All rights reserved.